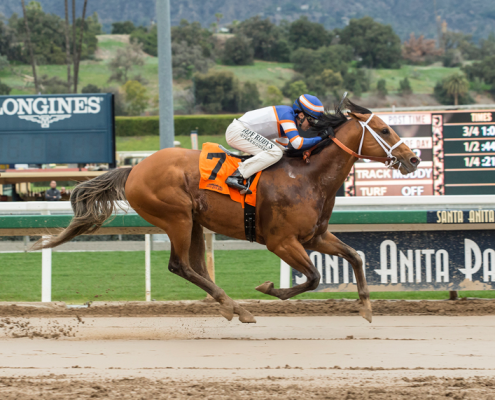 Alexander’s Homebred Tough Sunday Gets First Stakes Win as He Takes $100,000 Sensational Star S.
ARCADIA, Calif. (March 11, 2018)–A switch from 6 ½ furlongs on turf to a muddy main track, five scratches and a perfect stalking trip under Joe Talamo resulted in Nick Alexander’s homebred Tough Sunday notching his first-ever stakes win in Sunday’s $100,000 Sensational Star Stakes at Santa Anita. Trained by Steve Miyadi, the 6-year-old full horse by Alexander’s Grazen, prevailed by one length over a fast closing Solid Wager while getting the distance in 1:15.68. Out of Alexander’s General Meeting mare Sunday Dress, Tough Sunday was orphaned at birth, pale-fed for the first six months of his life and today, in his 18th career start, he enjoyed his biggest win. Needless to say, emotions were running high in the Winner’s Circle. Second, a neck off favored Richard’s Boy a quarter mile out, Tough Sunday switched leads on cue straightening for home and took command a furlong out under aggressive handling. “What a cool horse, he pretty much did all the work today,” said Talamo. “I just put him in the race. We had a great set up with Masochistic and Richard’s Boy inside of us and we just sat off of them and then he did all the work down the lane. The third choice at 9-2 in a field of nine older horses bred or sired in California, Tough Sunday paid $11.60, $5.80 and $4.40. With the winner’s check of $60,000, Tough Sunday now has earnings of $333,838. His overall mark now stands at 18-5-5-5. Ridden by Martin Pedroza, Solid Wager rallied from next to last to take second by a neck over Smokey Image. Off at 7-1, Solid Wager paid $6.60 and $4.80. Mid-pack early, Smokey Image rallied well under Tyler Baze for third money, finishing a half length in front of Tribal Storm. Off at 9-1, Smokey Image paid $5.80 to show. Fractions on the race were 21.71, 44.46 and 1:09.05.
https://tommytownfarms.com/wp-content/uploads/2016/02/TTT-LOGO-COLOR.png 0 0 none https://tommytownfarms.com/wp-content/uploads/2016/02/TTT-LOGO-COLOR.png none2018-03-11 23:16:012018-04-26 20:39:34Alexander's Homebred Tough Sunday Gets First Stakes Win as He Takes $100,000 Sensational Star S.